Now this is animation! Not only is it animation, it is animation novelty. 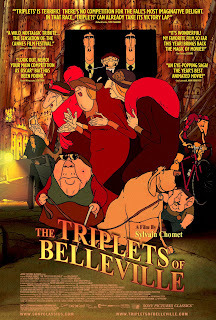 Director Sylvain Chomet has managed to make something new and invigorating with this film. The whole universe, from dogs, to people, to vehicles and even buildings is overly caricatured, yet it is done so well, and hits right on the button, so that it somehow looks more real than reality. This is all emphasized by the lack of dialogue. There are a few sentences spoken, but whether you understand French or not, it really doesn't matter. Best of all is the supporting role of the dog. It is the most truthful animation of a dog I have seen. Thankfully it doesn't talk (hear that Disney?) This film is all pantomime. And the music... oh, what music. Whether you're hosting a party or driving your car to work, the soundtrack for this film is never wrong to put on. I ran across the trailer for this gem while settling in to enjoy the spoils of a media binge. (a video store used video run). It was tucked somewhere in the superabundance of previews on a used VHS copy of Eternal Sunshine of a Spotless Mind. I actually rewound the tape to see the trailer again. The next day I sought it out. I was not at all disappointed. 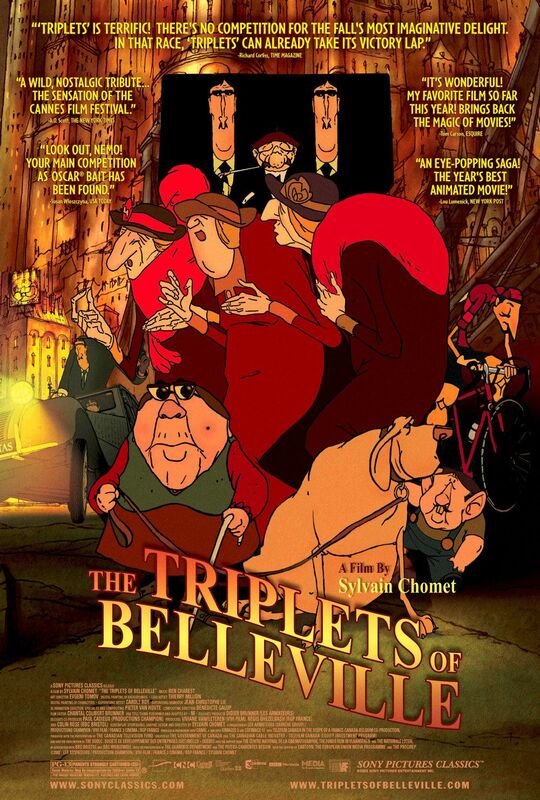 I have to say that The Triplets of Belleville has got to be my favorite animated film outside of the Asian market. And as a self professed "Otaku" and ongoing media junkie, that really is saying something. Thank you very much. That's very kind. And I absolutely agree there should be pictures on this blog, but to be perfectly honest, it all takes up way too much time. I just don't have any more time to spend on this, especially since I'm not making any money of it what so ever.